The good ol’ Big Apple, The Big City, The Melting Pot...or more commonly known as New York City. The big buildings, bright lights and the constant hustle and bustle of nonstop moving people. This city is ever growing and constantly changing, which is the magic of it all. I feel like every time I come to New York something is new and of course some things never change, like the fact that stop lights are mere suggestions for pedestrians and drivers. NY Tip: You don’t always have to stop and wait for the walk sign to come on. Just don’t die and you’re fine to cross. But aside from playing frogger to cross the street there are many things to do and see like of course eat, drink, people watch and eat some more. Since we only had a few days in New York I tried to jam in as much as I could. Casey had some meetings to attend to so I had some time to wander around by myself. Being alone in a big city sounded intimating at first but once I walked outside and realized that I had google maps and a phone so, I got over my fear really quick (ha-ha). Luckily, our hotel was close to a lot of things that I could walk to like Central Park, Times Square and Bryant Park. We also were in New York around the holidays so there were some extra things around the city that I could look at. 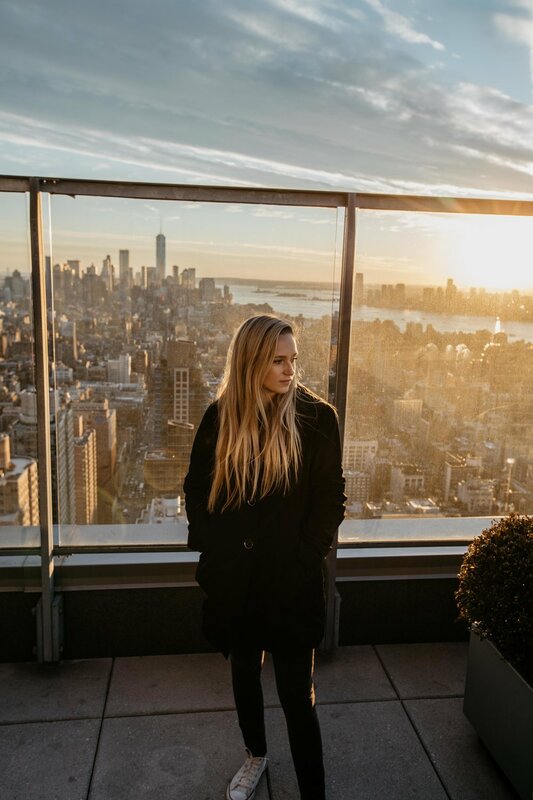 I don’t mind wandering around by myself most times, it’s always a time for me to pay attention to my surroundings and try to figure things out on my own. Plus being my size (child sized) I always feel like I have a higher risk of getting kidnaped or something when I am on my own, so I try to keep my eyes open and ears peeled. While I was walking around I found a few key spots that I think everyone needs to visit, whether you are here during the holidays or walking alone through the city. Central Park – This is for sure a staple in New York. Central Park is huge and is right smack in the middle of New York, so you really can’t miss it. It’s just up to you if you want to see the north part of the park or stay more south of the park, which is closer to Times Square and more touristy places. Since it was the holidays they set up a cute holiday shop to walk around and grab some handmade gifts and hot chocolate. Of Course – TIMES SQUARE – I mean this is a no-brainer. I personally like Times Square at night with all the lights but even during the day it’s a show. They have now included a platform of stairs for you conveniently people watch. I would grab a pretzel and take a seat! Bryant Park - Usually during the year, this park is full of green grass and free activities. However, when we came it was filled with an Ice skating rink, one tall Christmas tree and a mini north pole like village. It was magical, so perfect for grabbing a cup of coco made my Mrs. Clause and watch the kiddos ice skate. Rockefeller Center- Rockefeller Center is actually my favorite building to see the city views, you get a clear unobstructed view of New York City. 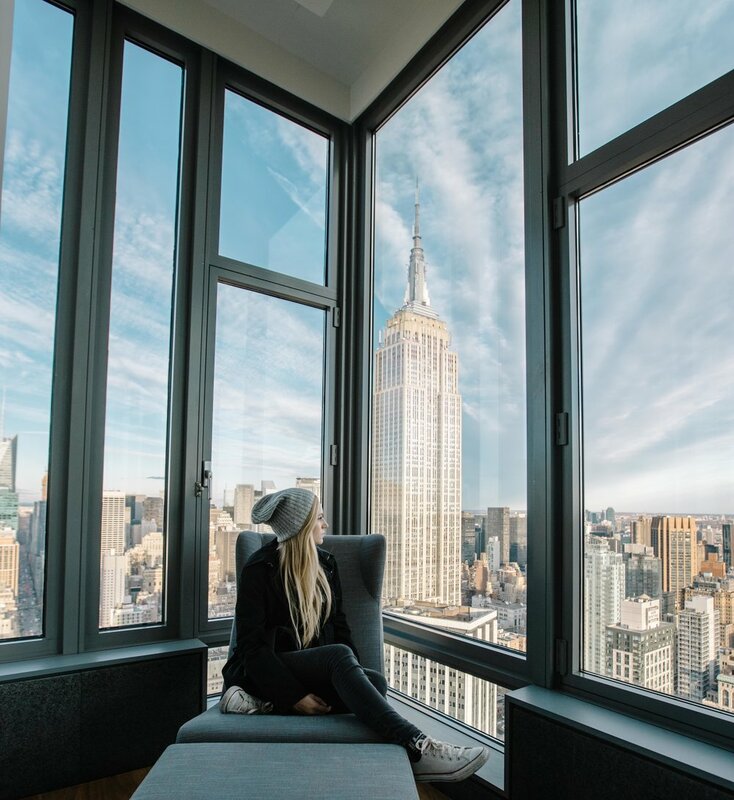 The Empire State building is a good one to see the views from too, however, they have more of a caged view, they put huge iron rods around the edge so you don’t fall over, respectable but still it’s in the way of my views! Empire State Building- regardless of the views you still have to check it out. However, quick tip for both buildings, get your tickets before you go. 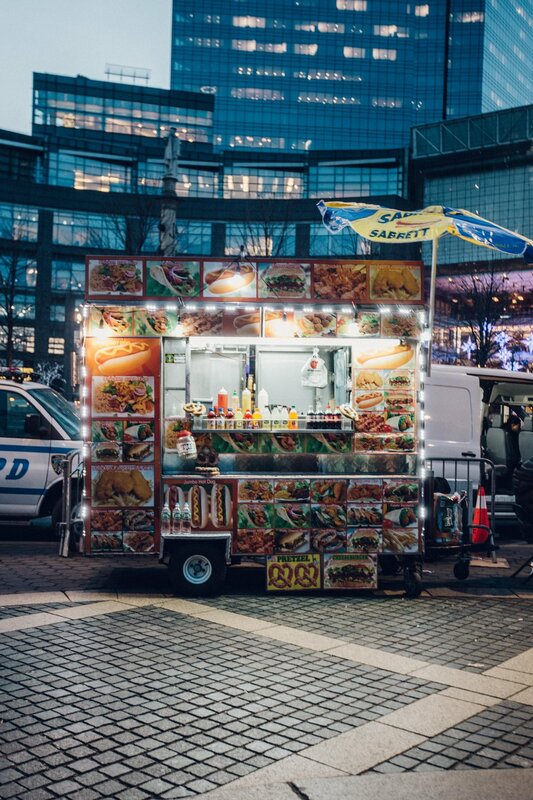 Get some food at a food cart- Just part of the New York experience. Radio City Music Hall – This looks better at night to me too. There is a lot you can see here like the famous Radio City Rockettes or a concert. Just check the website and grab some tickets before you go! Rockefeller Center tree lighting ceremony- So many people come out to start the Holiday season with this magnificent tree lighting show. Bryant Park – Like I said above they have ice skating and a Christmas tree too! 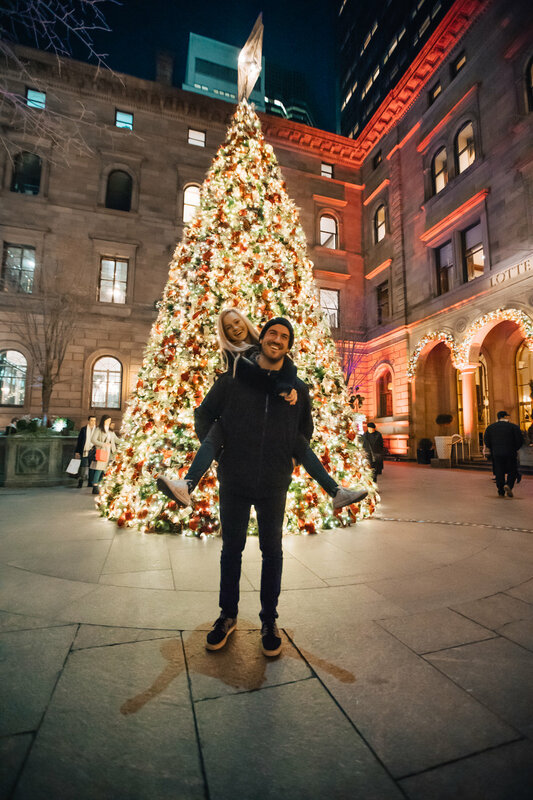 Holiday Market- Located right in the bottom left corner of Central Park is multiple holiday shops you can take a look at and get some crafty Christmas gifts. Dyker Heights – Okay, this is something I would have never known about unless I lived in NY. This neighborhood is located in Brooklyn so you will have to either uber or take the subway to see this (and once again this is only out during the holidays). 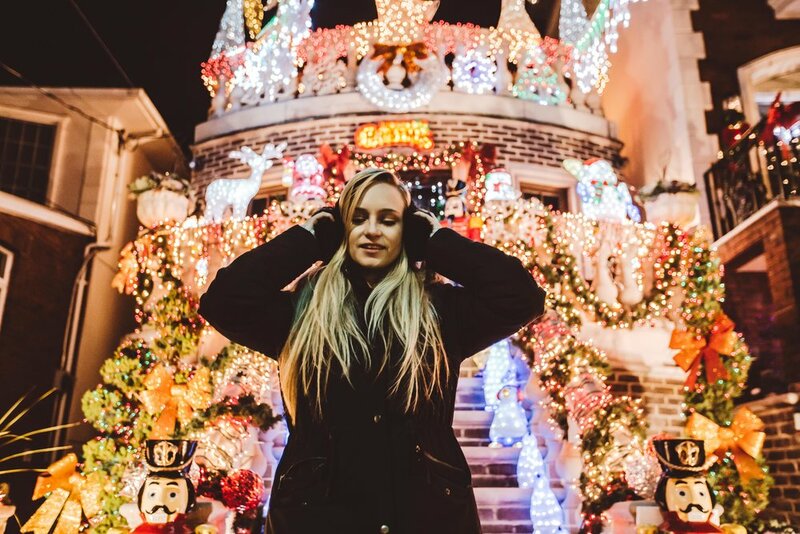 If you look up Dyker Heights, Brooklyn on Instagram in the Geotags you can find exactly how to get there or check the map below J I highly recommend this it’s fun for the whole family, the city has it safely blocked off and plenty of hot coco stands around to keep you warm. Lotte New York Palace- This place has a really pretty Christmas tree, it was pretty empty when we went so it made it perfect for taking our photos. Saks Fifth Avenue Lights- Saks puts on a magnificent display of lights during the holidays. The light display is also right by the Rockefeller Ice Skating rink so you get a two for one Holiday lights overload. All the window displays from Tiffany’s, Bergdorf’s, Saks, Barneys and Bloomingdales. The Courtyard of the Palace Hotel- aka Lotte New York Palace with the Christmas Tree. The Lobby of the Plaza Hotel – anyone else remember Eloise at The Plaza? And of course, the Ice Skating rink at the Rockefeller Center. This list really goes on and on, I had so many other places I wanted to check out like Black Tap and of course those crazy rainbow bagels, but I can save that for next time! 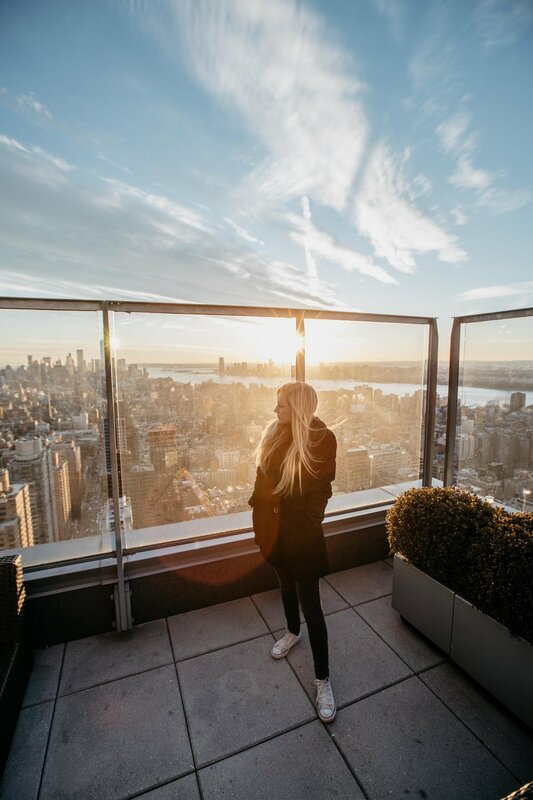 Don’t forget to leave a comment on your favorite place in New York!